While they all couldn’t be winners, students from the Hannibal Central School District displayed great comradery during a recent Battle of the Books competition, showcasing the attributes the contest attempts to instill in its participants. Students in the Hannibal Central School District recently competed in a Battle of the Books and showcased a great skill of literary knowledge. 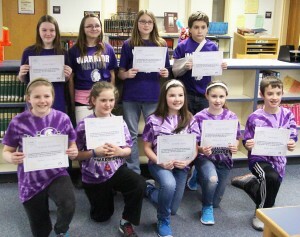 Pictured in front row from left: students Brianna Auchmoody, Theresa Przepiora, Kendall Cuyler, Avery Michaud and Ethan Skiff. Pictured in back from left: students Jordan Kigore, Aubre Forsythe (battle helper), Zoey Kuykendall and Daniel Lathrop. According to Bev Reyn, a reading teacher at Kenney Middle School and coordinator of the competition, the goal of isn’t to win or lose, but rather to mold students into lifelong readers. “I am very proud of the students that participated because their participation demonstrated a high degree of motivation, perseverance, and at all times they respectfully collaborated with their team members,” said Reyn. At the fifth and sixth grade level of the contest, students Avery Michaud, Kendall Cuyler and Ethan Skiff were able to outlast the team of Brianna Auchmoody and Theresa Przepiora in a close contest. One team of students from grades 6-8 also competed in the contest. While they were guaranteed to advance to the county-wide Battle of the Books competition, scheduled for March 24 at G. Ray Bodley High School in Fulton, students Jordan Kilgore, Zoey Kuykendall and Daniel Lathrop tested their abilities and performed admirably. “All of them work worked diligently in the classroom by passing all their classes, and completing all class work and homework while doing an abundance of reading outside of school,” said Reyn. Battle of the Books is a nationally recognized literacy program coordinated in Oswego County through the Center for Instruction, Technology and Innovation School Library System. The program encourages students to read, enhances reading comprehension and promotes teamwork as well as academic excellence.